Please join MAP, SAGE, the Center for American Progress Action Fund and Congresswoman Tammy Baldwin (D-WI) to discuss new legislation and a new report, "Improving the Lives of LGBT Older Adults," which address the unique challenges faced by LGBT elders. Congresswoman Baldwin will discuss legislation to help address these disparities, while experts in the field will share the latest research and policy analysis. Aging LGBT baby boomers are the first generation of LGBT people who have openly lived LGBT lives in large numbers. While most Americans face challenges as they age, LGBT elders have the added burden of a lifetime of stigma; familial relationships that lack recognition under the law; and unequal treatment under laws, programs, and services designed to support and protect older Americans. The lack of financial security, good health and health care, and social and community support is a fearful reality for a disproportionate number of LGBT older adults. 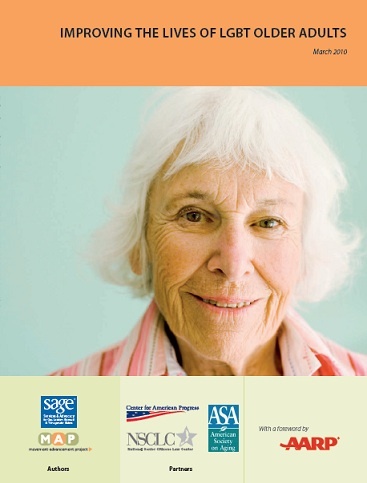 "Improving the Lives of LGBT Older Adults" was released in March 2010 by MAP and Services and Advocacy for Gay, Lesbian, Bisexual and Transgender Elders (SAGE) in partnership with the American Society on Aging, the Center for American Progress, and the National Senior Citizens Law Center. An abbreviated version of the report was released earlier today. Admission is free but space is extremely limited. RSVP required. Seating is on a first-come, first-served basis and not guaranteed. For more information, call 202-682-1611.